Around 80 pairs of high speed trains are running between Hong Kong West Kowloon Railway Station and Shenzhen Futian/ Shenzhen North Railway Station each day. The bullet trains run between Hong Kong West Kowloon and Shenzhen Futian with the travel time of 15 minutes. Ticket price is CNY 68 for a second class seat. Distance between is 26km (16mi). It takes 20 minutes to finish the distance of 39km (24mi) between Hong Kong West Kowloon Station and Shenzhen North Railway Station. Ticket cost is CNY 75 for a second class seat. Over 80 departures in total; departure time from 06:00 to 22:50; duration from 14M to 20M. Over 80 departures in total; departure time from 06:44 to 22:36; duration from 18M to 24M. The station is connected with MTR Austin Station and Kowloon Station. Austin Station is on West Rail Line, about 2-3 minutes’ walk to the railway station via exit A. Kowloon Station is on Tung Chung Line and Airport Express Line, about 8-10 minutes’ walk away via exit M.
Shenzhen subway line 2, line 3 and line 11 all have a stop nearby the station. By taking them, passengers can get to almost anywhere in Shenzhen directly or with transfers. For instance, upon arrival by Hong Kong to Shenzhen high speed train, passengers can get to Shenzhen Airport directly by subway line 11. It takes about 45 minutes and CNY7. Take subway line 5 to Qinhaiwan, then change to line 11 to airport. The overall travel time is about an hour and ticket fare is CNY8. By the way, subway line 4 also has a stop at this station. I was very happy with both the online booking service and with the train ride. Everything went even smoother that I had expected. Retrieving the tickets at the station was quite simple. Trains were on time, well organized, clean and fast. Information was given in English both at the stations and on the trains, and it was clear and easy to understand. Overall, it was a very satisfactory trip. Thank you again for your support. Overall we were very impressed with the train service. It was very efficient. Our journey was only very short HKG to Shenzhen. After reading feedback we were expecting long queue to clear China immigration in Kowloon station but this process was very efficient and fast. Next time we might take train from HKG to Shanghai! Thank you very much for your attention and care. Everything was OK and my train journey was good. I had a great experience with the train and everything went smoothly. Thank you for your support with my travel! 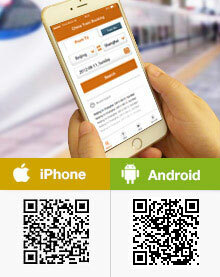 The booking service is satisfactory and it helped us to save more time for train ticket purchase. Especially, it is convenient for foreigners who do not speak Chinese but plan to travel by train. Thank you once again. I do like your Train booking service,I find it easy and efficient. We had an excellent experience. Everything worked well, and the train was on time and in an excellent state. What is the fastest way to get from SZX to Tsim Sha Tsui, Hong Kong? 1. Does it make sense to take the Shenzhen to Hong Kong high speed train? 2. Is it easier to just take the subway line 1 and transfer to the Lo Wu Station? 3. Where does immigration take place when crossing from Shenzhen to Hong Kong? I think the most convenient way should be bus. There are buses offer to Tsim Sha Tsui area from the airport, runs around every 20 or 30min. You will do the immigration at Shenzhen Bay Port. If i take the high speed train from hk to shenzhen, can i apply for visa on arrival? No. You need to apply visa in advance. From Futian railway station, how to proceed to Huaqiangbei? You can take metro line 2 from Futian to Huaqingbei directly, 3 stops. Do I need to book a ticket in advance? Can I buy a ticket @ticket counter? Since there are many rides a day between, you can buy the tickets at ticket counter. You can buy the next available one directly. If you need to travel at a fixed time or rides, it maybe safer to book the seats in advance.